Those who are able to become an Emergency room Nurse enjoy a fast paced and exciting career that allows them help others every day. Nurses must acquire extensive education in healthcare before they can become registered nurses in any part of the hospital. It’s important that those considering nursing as a career understand what they’re getting themselves into. Working full time as an emergency room nurse often involves working long hours in strenuous situations, according to Nursing Notes. Ideally, aspiring nurses genuinely enjoy providing others with care and attending to other’s healthcare problems. While being an ER nurse is hard work, the work comes along with a great deal of rewards. Individuals on an academic track towards a career in nursing generally need to complete at least two years of study before joining the work force. Regulations concerning registered nurse requirements sometimes vary among different states and localities with some institutions requiring that nurses complete a full four years of study towards a Bachelor of Science degree in nursing. However, an associate’s degree is enough to become a registered nurse in most places. Once this degree is completed, candidates must take an exam to become officially registered as nurses. When studying for their degrees, nursing students need to complete coursework in subjects such as nursing theory, anatomy, chemistry, biology, psychology, and nutrition. Not only do nursing students need to complete theoretical studies in class, but they also need to participate in hands-on experiences that will help them familiarize themselves with the working environment of a nurse. 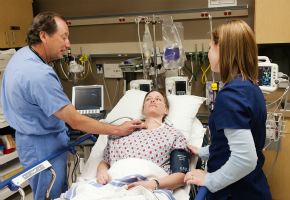 Nursing students who wish to pursue careers as ER nurses will attempt to focus on hands-on experiences in the emergency room when they are completing their academic requirements. Skills that are important to emergency room nurses are the ability to multitask, communicate with patients and other hospital staff members, and work quickly. Because coursework for those studying nursing is heavy in science courses, those who wish to pursue careers as ER nurses should be strong in science and should be interested in these subjects. Nurses in the emergency room work with doctors and other healthcare professionals to monitor the health conditions of and attend to the injuries of those who enter the emergency room with symptoms or injuries that need immediate attention. Typical emergency room visits are made by patients who suffer from conditions such as allergic reactions and accident injuries. The job of an emergency room nurse is to question and examine patients, determine what the patient’s needs are and how critical his or her injury is, stabilize the patient with the appropriate treatment, and either discharge the patient or arrange for the patient to have a room in the hospital. Some of the positives of working as an emergency room nurse that registered nurses often call attention to are the fast paced nature of the job and the fact that they can help save lives every day. Most emergency room nurses note that their shifts pass quickly and are constantly filled with action and activity. It helps if those who are on their way to become and Emergency Room Nurse would prefer this fact paced environment and enjoy working in a position where decisions must be made quickly.